This time I’d like to talk about Ikebana and Art. One of the driving forces for the Ikebana boom after the war was a slogan by Sofu Teshigahara that Ikebana is art. I have already talked about why the word “art” had such magical power at that time. So what happened to the slogan during the 1980’s when Ikebana was declining? In 1960’s, the word “art” seemed to have a special attraction. It meant something intelligent and cultural. But it does not seem be so special for women in 1980’s. The key word “art” (as in Western art) no longer seemed to be so effective in promoting Ikebana among young women. My focus is on the changing perception of the word “art” among young women in Japan. Since the 1960s, there have been many more opportunities for them to experience authentic Western art and a wider variety of art activities. 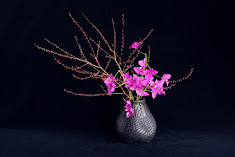 Ikebana is no longer unique as an artistic activity. My third hypothesis about the reason for the end of Ikebana boom is that the word “art” has comparatively lost its appeal for young women. However, the role the word “art” played in the Ikebana boom was actually rather superficial. What is important is that the movement to make Ikebana into art had a significant influence on the development of Ikebana after the war. I’ll talk more about this complicated topic from the next issue. I made this work for my client who wanted me to use three Christmas colors. It is a rather difficult request that requires careful calculation to find the right balance of colors and flower materials.